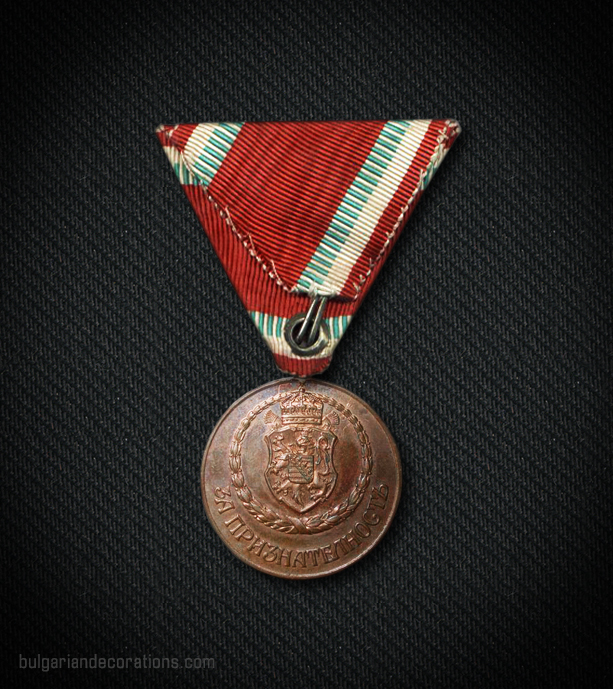 Obverse: A decorative sunburst design with superimposed the year 1915 and a plain oval beneath it, charged with a Greek cross made of vertical flutings. All is depicted within a ring, inscribed with the text “БЪЛГАРСКО ДРУЖЕСТВО „ЧЕРВЕНЪ КРЪСТЪ“ / translation: Bulgarian Society “Red Cross” / and a small decorative element at the bottom. 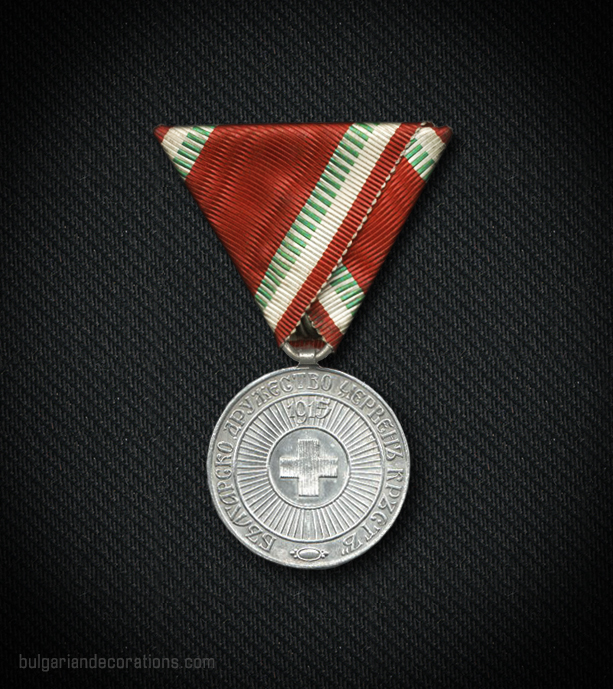 The second emission of the medal has an amended design – it lacks the year 1915, the Greek cross and its base are now enamelled in red and white respectively, and the inscription has been changed to “БЪЛГАРСКО ДРУЖЕСТВО ЧЕРВЕНЪ КРЪСТЪ · ЗА БЛАГОТВОРИТЕЛНОСТЬ ·“ / translation: Bulgarian Society Red Cross · For Charity · /, omitting the decorative element at the bottom. Reverse: The small Bulgarian royal coat of arms depicted within a circular laurel wreath. At the bottom is inscribed “ЗА ПРИЗНАТЕЛНОСТЬ“ / translation: For gratitude / embowed. 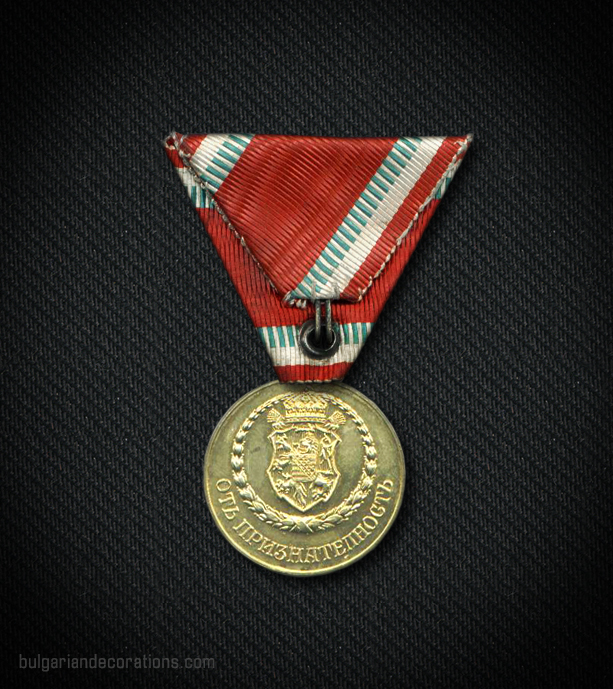 The second emission of the medal features the same design with a minor change in the inscription: “ОТЪ ПРИЗНАТЕЛНОСТЬ“ / translation : Of gratitude /. 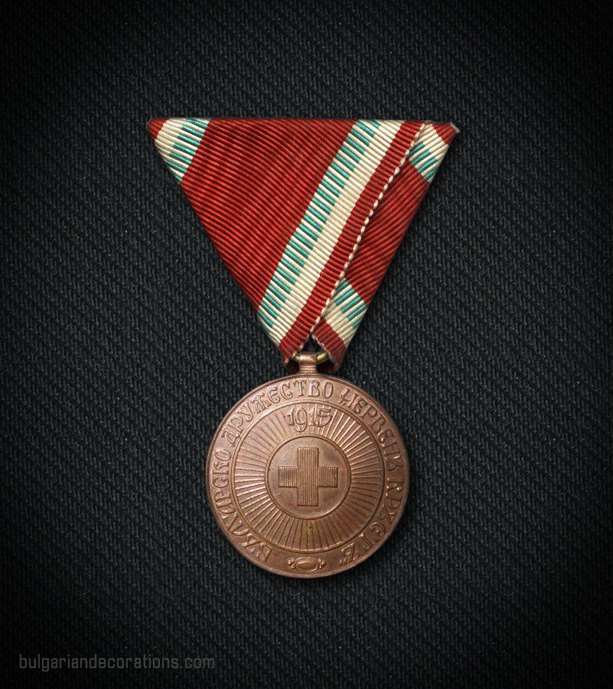 The medal has been founded near the end of the Great War, as a decoration, used for incentive of philanthropy and charity, voluntary medical service or any other type of merit in regard to the activity of the Bulgarian Red Cross society and its wartime efforts. In its essence, it’s a wartime medal. That’s the reason why it bears the inscription ‘1915’ – the year which Bulgaria entered the war. The medal had only two classes initially – silver (silvered bronze) and bronze medal. 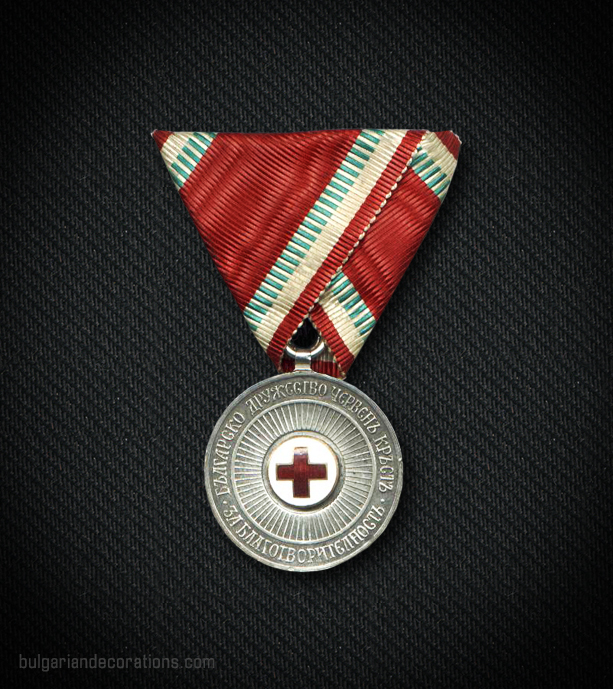 It has been awarded to volunteers in the field hospitals, medics, Red Cross activists, civilians who aided the activities of the Society, fundraisers, financial donors, etc. After the end of the war, the medal had to be redesigned and transformed, in order to abolish its wartime designation. In 1929 (or later), a new medal has been instituted, replacing the old one. It featured a very similar design of both the badge and ribbon, but instead of silver and bronze medals, the classes now were only gold and silver, both having enamelled central medallions. Logically, the year 1915 has also been omitted. 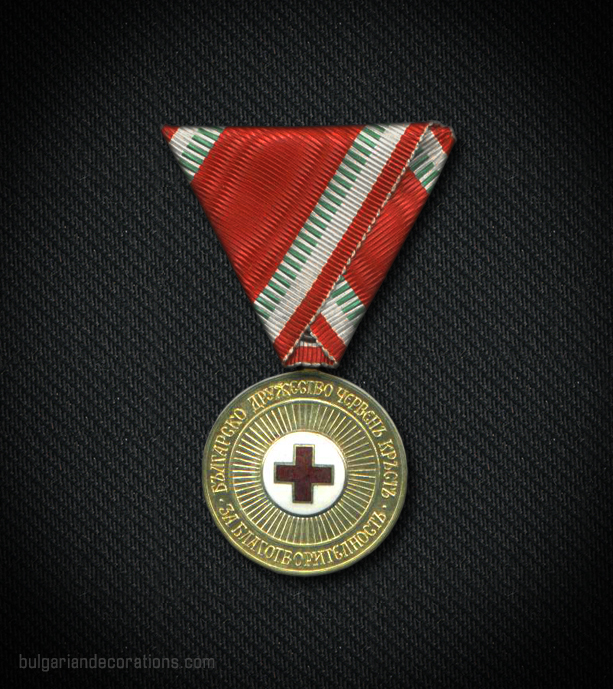 In this form, the medal has been awarded for the same merits as before, plus as a reward for continuous membership on behalf of Red Cross activists. The latter were supposed to be decorated with a silver medal after 15 years and/or gold medal after 25 years of continuous membership. The designer of the medal remains unknown.